The Tiger volleyball team has had three matches this season and is 3-1 after it recently won against Linn-Mar on the road on Tuesday, Sept. 17. 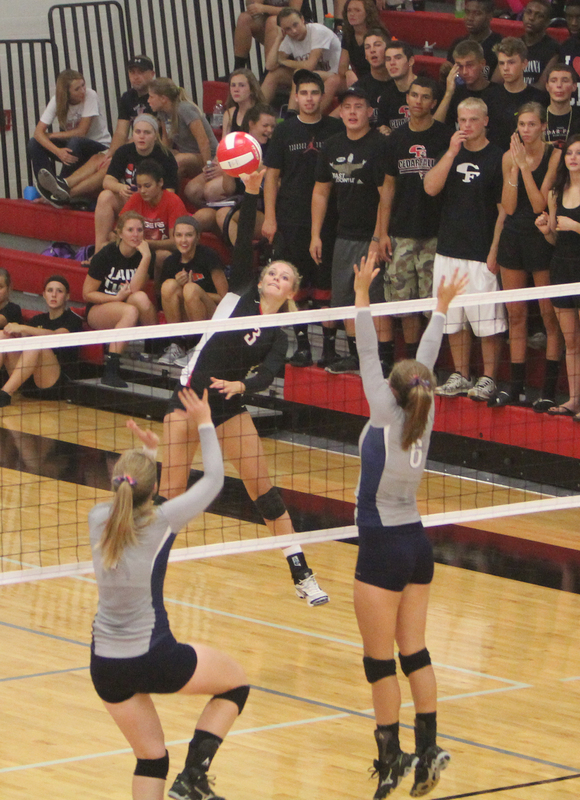 The scores for the sets in that matchup at Linn-Mar were 25-21, 25-22 and 25-22. The Tigers have also competed well in two tournaments, including a first place finish at the Ames Invite, where they overpowered No. 4 Urbandale, No. 3 Sioux City Bishop Heelan and No. 5 Charles City to capture their first tournament crown in two years. Cedar Falls started out the season ranked ninth out of 10 teams but shot right up to third in the rankings after beating Dubuque Hempstead in their first match. The setback came on Tuesday, Sept. 9 when No. 9-rated Xavier from 4A came visiting the 5A Tigers. The Saints left with the win after three close sets. “We have a lot of work to do but have the potential to be very good,” senior Andrea Leisinger said talking about this year’s volleyball season. This year the Cedar Falls volleyball team is a little different, with many of the seniors who had played now graduated. “It is hard losing seniors and adjusting to new players, but we’re getting better every time we step on the court and play together. It’s tough at first, but you get used to it.” senior Kaz Brown said. There have been other setbacks. Outside hitter Alicia Harrington came down wrong after blocking and hurt her achilles tendon during the game against Xavier. Harrington hopes to be back to play this weekend to help the Tigers keep winning. Brown has also suffered from a shoulder injury from basketball last year but hopes to have all of her strength back by October. Last year the Tigers just fell short of going to State after losing the match to get there with a record of 28-11. This year the team’s goal is not only to get to State but to win it all. This Saturday the CFHS volleyball team is going to be playing at the Dike-New Hartford volleyball tournament. The Tigers also start a four night home stretch with a match against Waterloo East this Tuesday, Sept. 24.